TURNERS FALLS — Joining the Turners Falls High School student recipient senior Andy Craver, Jessica Vachula-Curtis is this year’s staff recipient of the McGraw Uplift Award. 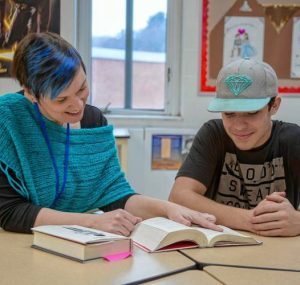 Like Craver, English and special education teacher, Vachula-Curtis was nominated more than once, “showing their positive influence on our community,” according to Principal Annie Leonard. Following the death of Assistant Principal Earl McGraw in fall 2016, students suggested the creation of an award that would honor his spirit and sustain his lasting influence on the school. This is the third year of the award, which is given to students and staff who exemplify McGraw’s principles. The school community nominates students and staff. McGraw’s principles were treating everyone with respect and without judgment, seeing someone who is down and lifting them up with love and laughter, going after goals with all your heart and helping others go after their goals. One nominator said, “I can’t think of anyone who better exemplifies Mr. McGraw’s positive attitude and energy with students,” according to Leonard.